Sunday's post about Hamilton House (click HERE), would have been too long had I done justice there to the delightful Garden House, so herewith pictures from last summer, and from 1926, of the cottage that inspired Henry Davis Sleeper to decorate Beauport as an American house. The cottage was built in 1902 from parts salvaged from a house in Newmarket, NH, and subsquently enlarged by two more rooms to the form it has today. 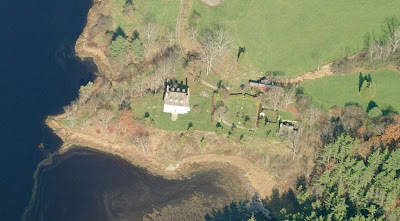 It is interesting to compare a modern aerial view with a map of the grounds drawn in 1932 for Great Georgian Houses of America published by the Architect's Emergency Committee to provide work for draftsmen and architects during the great Depression. Amusingly, the river is labeled as the Piscataqua, which divides New Hampshire and Southern Maine. In fact, Hamilton House is on the Salmon Falls river, a tributary. The cottage was built as one room garden retreat, with careful attention paid to scale and texture in materials. Although much seen since, this sort of careful attention paid to the appearance of age had rarely been applied to an American design before this---although of course European inspired examples were rampant. This is concurrent with a rise in pride in traditional American design and craft. The semi-octagonal entry to the later wing is charm itself, carefully composed as a painting to evoke an earlier New England. The panes in the transom are bull's eye glass. The main room, with its salvaged 18th century paneling. Great attention was paid to the furnishings as to texture, patina, and scale. The room has a romanticized 18th century appearance, on a modern scale, with its high ceilings and balconies. The window is masterful---designed to echo the arched stair windows of the main house, it is much larger, but the small pane size retains the scale of the building. Notice the ship's models hanging in front of the window, a favorite motif of the Colonial revival. 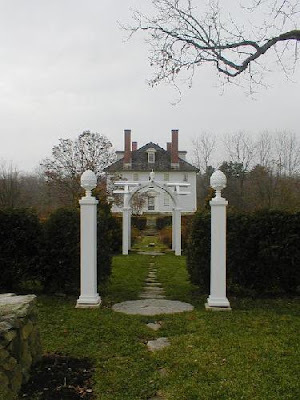 If the Dilettante were to make a criticism of Hamilton House's otherwise excellent management by Historic New England, it would be in the secondary rooms of the garden house, of great architectural interest themselves. Maintenance is clearly deferred. The tiny vestibule is shabby, with random storage (there are both a carriage house and a barn on the property, one presumes with some storage space. The other small room is used as the very necessary gift shop, but so poorly arranged as to completely obliterate the room--and yes, I understand very well, as president of an historic house museum myself, the problems involved with volunteers and good intentions and necessary functions. That said, it should still be better arranged. The main room fireplace wall could use some clean-up of arrangement also. And the opposite wall, with an ice cream cooler? The less said the better. End of rant. Back to our program. The room sees service today as a beautiful setting for events, concerts, or just as the Tysons intended--a cool retreat from the garden. The irony of the model of a hardscrabble one room New England cottage being adapted as the playhouse of two wealthy women, with its echoes of the Hameau at Versailles does not go unnoticed, but the results of the Tyson's romanticized vision of Olde New England are charm itself. 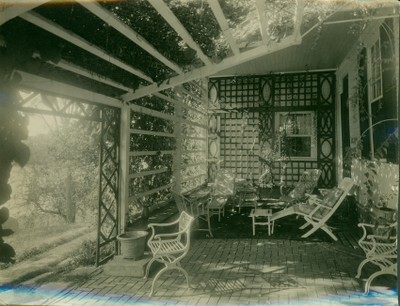 In 1926, this area was called the 'Coffee Garden' by the Vaughans. 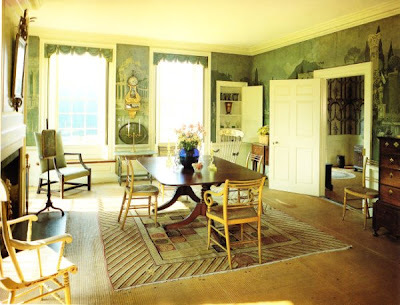 For the faithful reader who wanted a closer look at the valances, click HERE for Reggie Darling's post at EEE about the Hamilton House dining room. 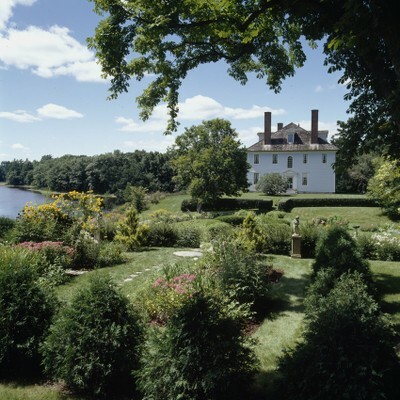 Hamilton House, in South Berwick, Maine, is one of the loveliest--and most romantic-- properties imaginable. Set on a bluff at the head of the Salmon Falls River and backed by rolling meadows and woodlands, it is an Arcadian ideal brought to life. A large, simple Georgian inspired house built in 1785 by Jonathan Hamilton a West Indies trader, and in his day part of a bustling settlement overlooking his busy wharves, it had fallen on hard times by the late 19th century. Enter the Tysons, persuaded by their friend Sarah Orne Jewett, who had based her novel The Tory Lover at Hamilton House, to buy it and restore it. 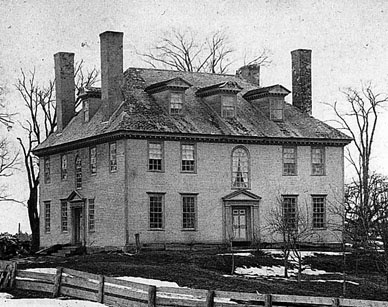 Emily Tyson was the widow of the president of the Baltimore and Ohio railroad, and she and her stepdaughter Elise set about 'restoring' Hamilton House to a glory that far exceeded its earlier life. The Tyson's domestic needs were greater than those of Jonathan Hamilton. 's day. Their renovation architect, Bostonian Herbert Browne, an early proponent of the Colonial revival, also practiced in a grand baroque style that bordered on lunacy (more about that in an upcoming post). He exercised restraint here, adding two low wings (since removed) , one for services, one a porch and first floor bedroom, fronting both with neo-classical treillage covered in vines to make them appear to be open porches. Even as many of their peers were erecting large houses in the fashionable seaside resorts a dozen miles to the south on the coast, the ladies Tyson were part of another movement, one that eschewed fashion in favor of romantic simplicity. Jonathan Hamilton's barn was moved, and a lovely sunken garden was built in its foundations, with a shady pergola, now lost, bordering the river bluff and framing the views. In the house, with its large and well proportioned rooms, few architectural changes were made. Taking their cues from the relative simplicity of the interiors, decoration was light and airy---white ruffled or chintz curtains, painted furniture, straw matting, cheerful old fashioned wallpapers---the principles of Elsie deWolfe applied to a colonial inspired design. 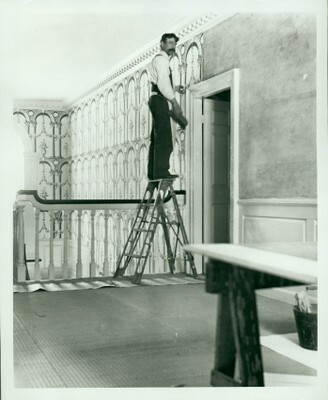 In the hall, scraps of the original English 'pillar and arch' pattern wallpaper were found, and the Tysons had it reproduced, probably the earliest instance of in America of an historic wallpaper being reproduced in situ. Sleeper was riveted by the Tyson's collections of hooked rugs, colored glass cued to the decorative schemes of each room, old fashioned furniture, and old prints and objects, all composed in lovely arrangements.. Most of all, he was riveted by the garden house. On the drive up to South Berwick, the party had noticed an ancient house being demolished in Essex, Upon return, Sleeper bought that house, and began incorporating the salvage into his own house, decorating it brilliantly with furnishings like those he had seen at Hamilton House that summer afternoon. Sleeper's work at Beauport caught the eye of Henry Francis Dupont, who hired him to do up a huge house at Southampton, which in turn begat Dupont's Winterthur, which house, along with the restoration of Colonial Williamsburg, did so much to begat the much more correct and dull version of 18th century American Georgian that dominated a certain sort of WASP taste through the 1970's. But, I am wandering from my subject. Back we go. The dining room, with murals by George Porter Fernald. The use of humble painted chairs with fine mahogany furniture was also new and fresh, and demonstrates the Tyson's talent at the game of high and low. 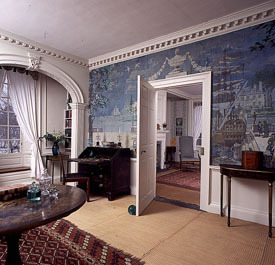 In the drawing room, he painted scenes of famous buildings of the area Charmingly, the murals incorporated leaves and trees from the existing wallpaper. In the dining room, a classical landscape, reminiscent of scenic wallpapers, made for one of the loveliest rooms of its time. Porter ran the horizon of the mural to echo that outside, and captured exactly the colors of the outside landscape on a summer day. The distinctions between outside and inside thus blurred, a visual poetry was achieved. Of the many beautiful rooms in every style that I've been in, this is one of the loveliest of all. 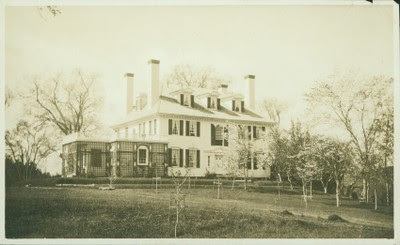 After Mrs. Tyson's death her stepdaughter, by now Mrs. Henry Vaughan, continued to occupy Hamilton House in the summer. 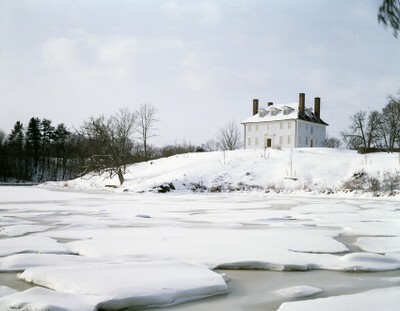 In 1946 she left the estate to the Society for the Preservation of New England Antiquities (SPNEA), now unfortunately renamed "Historic New England. Hamilton House was part of a larger movement in American culture and aesthetics, and is one of the best surviving examples of Colonial Revival decoration, its interiors now carefully restored to the early 1900s scheme. Most of the pictures below are from a late afternoon, late summer visit that I made this year, interspersed with a few photographs originally published in House Beautiful in 1926, The garden house will be featured in an upcoming post. Late For My Own Party---The Dilettante is One.